Mount Ararat (/ˈærəˌræt/ ARR-ə-rat; Turkish: Ağrı Dağı; Armenian: Մասիս, Masis and Արարատ, Ararat) is a snow-capped and dormant compound volcano in the extreme east of Turkey. It consists of two major volcanic cones: Greater Ararat and Little Ararat. 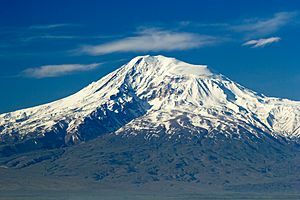 Greater Ararat is the highest peak in Turkey and the Armenian plateau with an elevation of 5,137 m (16,854 ft); while, Little Ararat's elevation is 3,896 m (12,782 ft). The Ararat massif is about 35 km (22 mi) wide at ground base. The first efforts to reach Ararat's summit were made in the Middle Ages. However, it was not until 1829 when Friedrich Parrot and Khachatur Abovian, accompanied by four others, made the first recorded ascent. Despite the scholarly consensus that the "mountains of Ararat" of the Book of Genesis do not refer specifically to Mt. Ararat, it has been widely accepted in Christianity as the resting place of Noah's Ark. It is the principal national symbol of Armenia and has been considered a sacred mountain by Armenians. It is featured prominently in Armenian literature and art and is an icon for Armenian irredentism. 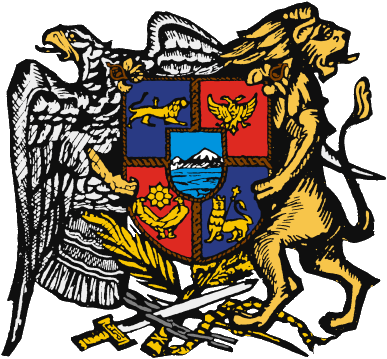 Along with Noah's Ark, it is depicted on the coat of arms of Armenia. Mount Ararat forms a near-quadripoint between Turkey, Armenia, Azerbaijan and Iran. Its summit is located some 16 km (10 mi) west of both the Iranian border and the border of the Nakhchivan exclave of Azerbaijan, and 32 km (20 mi) south of the Armenian border. The Turkish–Armenian–Azerbaijani and Turkish–Iranian–Azerbaijani tripoints are some 8 km apart, separated by a narrow strip of Turkish territory containing the E99 road which enters Nakhchivan at . From the 16th century until 1828 the range was part of the Ottoman-Persian border; Great Ararat's summit and the northern slopes, along with the eastern slopes of Little Ararat were controlled by Persia. Following the 1826–28 Russo-Persian War and the Treaty of Turkmenchay, the Persian controlled territory was ceded to the Russian Empire. Little Ararat became the point where the Turkish, Persian, and Russian imperial frontiers converged. The current international boundaries were formed throughout the 20th century. The mountain came under Turkish control during the 1920 Turkish–Armenian War. It formally became part of Turkey according to the 1921 Treaty of Moscow and Treaty of Kars. In the late 1920s, Turkey crossed the Iranian border and occupied the eastern flank of Lesser Ararat as part of its effort to quash the Kurdish Ararat rebellion, during which the Kurdish rebels used the area as a safe haven against the Turkish state. Iran eventually agreed to cede the area to Turkey in a territorial exchange. The Iran-Turkey boundary skirts east of Lesser Ararat, the lower peak of the Ararat massif. As of 2004[update] the mountain is open to climbers only with "military permission". The procedure to obtain the permission involves submitting a formal request to a Turkish embassy for a special "Ararat visa", and it is mandatory to hire an official guide from the Turkish Federation for Alpinism. Access is still limited, even for climbers who obtain the necessary permission, and those who venture off the approved path may be fired upon without warning. Ararat (sometimes Ararad) is the Greek version of the Hebrew spelling (אֲרָרָט; 'RRṬ) of the name Urartu, a kingdom that existed in the Armenian plateau in the 9th–6th centuries BC. German orientalist and Bible critic Wilhelm Gesenius speculated that the word "Ararat" came from the Sanskrit word Arjanwartah, meaning "holy ground." 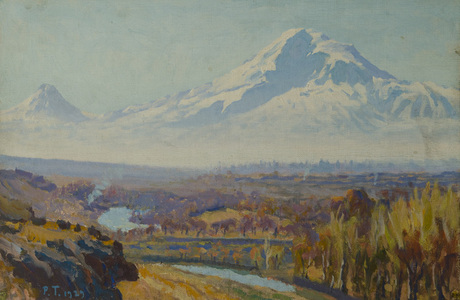 Some Armenian historians, such as Ashot Melkonyan, link the origin of the word "Ararat" to the root of the endonym of the indigenous peoples of the Armenian Highland ("ar–"), including the Armenians. 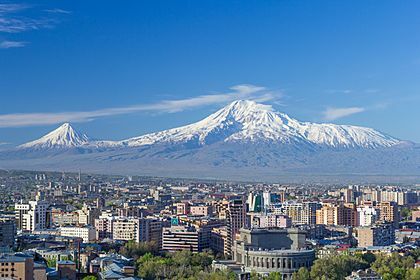 The mountain is known as Ararat in European languages, however, none of the native peoples have traditionally referred to the mountain by that name. In classical antiquity, particularly in Strabo's Geographica, the peaks of Ararat were known in ancient Greek as Ἄβος (Abos) and Νίβαρος (Nibaros). The traditional Armenian name is Masis (Մասիս Template:IPA-hy; sometimes Massis). However, nowadays, the terms Masis and Ararat are both widely, often interchangeably, used in Armenian. The folk etymology expressed in Movses Khorenatsi's History of Armenia derives the name from king Amasya, the great-grandson of the legendary Armenian patriarch Hayk, who is said to have called the mountain Masis after himself. According to Russian orientalist Anatoly Novoseltsev the word Masis derives from Middle Persian masist, "the largest." According to Armenian historian Sargis Petrosyan the mas root in Masis means "mountain", cf. Proto-Indo-European *mņs-. According to archaeologist Armen Petrosyan it originates from the Māšu (Mashu) mountain mentioned in the Epic of Gilgamesh, which sounded Māsu in Assyrian. The Turkish name is Ağrı Dağı Template:IPA-tr, Ottoman Turkish: اغـر طﺎﻍ Ağır Dağ), i.e. "Mountain of Ağrı". Ağrı literally translates to "pain" or "sorrow". This name has been known since the late Middle Ages. Greater and Lesser Ararat are known as Büyük Ağrı and Küçük Ağrı, respectively. 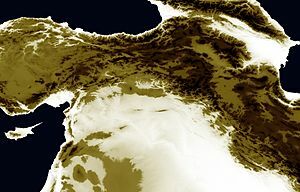 The traditional Persian name is کوه نوح, [ˈkuːhe ˈnuːh], Kūh-e Nūḥ, literally the "mountain of Noah". The Kurdish name of the mountain is çiyayê Agirî IPA: [t͡ʃɪjaːˈje aːgɪˈriː], which translates to "fiery mountain". Mount Ararat is located in the Eastern Anatolia Region of Turkey between the provinces of Ağrı and Iğdır, near the border with Iran, Armenia and Nakhchivan exclave of Azerbaijan, between the Aras and Murat rivers. Its summit is located some 16 km (10 mi) west of the Turkey-Iran border and 32 km (20 mi) south of the Turco-Armenian border. The Ararat plain runs along its northwest to western side. 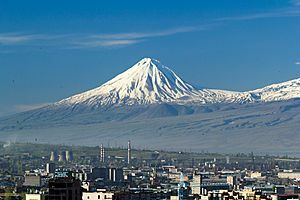 An elevation of 5,165 m (16,946 ft) for Mount Ararat is given by some encyclopedias and reference works such as Merriam-Webster's Geographical Dictionary and Encyclopedia of World Geography. However, a number of sources, such as the United States Geological Survey and numerous topographic maps indicate that the alternatively widespread figure of 5,137 m (16,854 ft) is probably more accurate. The current elevation may be as low as 5,125 m (16,814 ft) due to the melting of its snow-covered ice cap. The ice cap on the summit of Mount Ararat has been shrinking since at least 1957. In the late 1950s, Blumenthal observed that there existed 11 outlet glaciers emerging from a summit snow mass that covered about 10 km2 (3.9 sq mi). 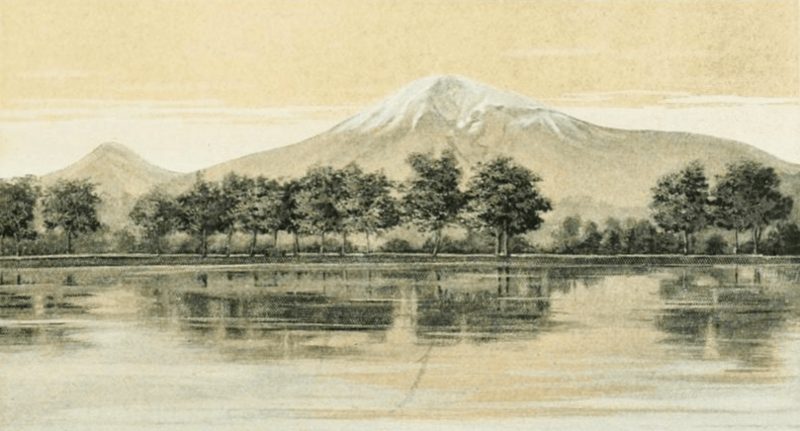 At that time, it was found that the present glaciers on the summit of Ararat extend as low as an elevation of 3,900 meters (12,800 ft) on the north-facing slope, and an elevation of 4,200 meters (13,800 ft) on its south-facing slope. Using pre-existing aerial imagery and remote sensing data, Sarıkaya and others studied the extent of the ice cap on Mount Ararat between 1976 and 2011. They discovered that this ice cap had shrunk to 8.0 km2 (3.1 sq mi) by 1976 and to 5.7 km2 (2.2 sq mi) by 2011. They calculated that between 1976 and 2011, the ice cap on top of Mount Ararat had lost 29% of its total area at an average rate of ice loss of 0.07 km2 (0.027 sq mi) per year over 35 years. This rate is consistent with the general rates of retreat of other Turkish summit glaciers and ice caps that have been documented by other studies. Blumenthal estimated that the snow line had been as low as 3,000 meters (9,800 ft) in elevation during the Late Pleistocene. Such a snow line would have created an ice cap of 100 km2 (39 sq mi) in extent. However, he observed a lack of any clear evidence of prehistoric moraines other than those which were close to the 1958 glacier tongues. Blumenthal explained the absence of such moraines by the lack of confining ridges to control glaciers, insufficient debris load in the ice to form moraines, and their burial by later eruptions. Years later, Birman observed on the south-facing slopes a possible moraine that extends at least 300 meters (980 ft) in altitude below the base of the 1958 ice cap at an elevation of 4,200 meters (13,800 ft). He also found two morainal deposits that were created by a Mount Ararat valley glacier of Pleistocene, possibly Wisconsinan (Last Glacial Maximum) age, downvalley from Lake Balık. The higher moraine lies at an altitude of about 2,200 meters (7,200 ft) and the lower moraine lies at an altitude of about 1,800 meters (5,900 ft). The lower moraine occurs about 15 kilometers (9.3 mi) downstream from Lake Balık. Both moraines are about 30 meters (98 ft) high. It is suspected that Lake Balık occupies a glacial basin. Mount Ararat is a polygenic, compound stratovolcano. Covering an area of 1,100 km2 (420 sq mi), it is the largest volcanic edifice within the region. Along its northwest–southeast trending long axis, Mount Ararat is about 45 kilometers (28 mi) long and is about 30 kilometers (19 mi) long along its short axis. It consists of about 1,150 km3 (280 cu mi) of dacitic and rhyolitic pyroclastic debris and dacitic, rhyolitic, and basaltic lavas. Mount Ararat consists of two distinct volcanic cones, Greater Ararat and Lesser Ararat (Little Ararat). The western volcanic cone, Greater Ararat, is a steep-sided volcanic cone that is larger and higher than the eastern volcanic cone. Greater Ararat is about 25 kilometers (16 mi) wide at the base and rises about 3 kilometers (1.9 mi) above the adjacent floors of the Iğdir and Doğubeyazıt basins. The eastern volcanic cone, Lesser Ararat, is 3,896 meters (12,782 ft) high and 15 kilometers (9.3 mi) across. These volcanic cones, which lie 13 kilometers (8.1 mi) apart, are separated by a wide north–south-trending crack. This crack is the surface expression of an extensional fault. Numerous parasitic cones and lava domes have been built by flank eruptions along this fault and on the flanks of both of the main volcanic cones. Mount Ararat lies within a complex, sinistral pull-apart basin that originally was a single, continuous depression. The growth of Mount Ararat partitioned this depression into two smaller basins, the Iğdir and Doğubeyazıt basins. This pull-apart basin is the result of strike-slip movement along two en-echelon fault segments, the Doğubeyazıt–Gürbulak and Iğdir Faults, of a sinistral strike–slip fault system. Tension between these faults not only formed the original pull-apart basin, but created a system of faults, exhibiting a horsetail splay pattern, that control the position of the principal volcanic eruption centers of Mount Ararat and associated linear belt of parasitic volcanic cones. The strike-slip fault system within which Mount Ararat is located is the result of north–south convergence and tectonic compression between the Arabian Platform and Laurasia that continued after the Tethys Ocean closed during the Eocene epoch along the Bitlis–Zagros suture. Topography of Paradise by Jesuit scholar and polymath Athanasius Kircher as pictured in his book Arca Noë (1675). In the northeast, in the mountains above Armenia stands Mount Ararat, shown with a rectangular-shaped ark on the summit. Descent of Noah from Ararat by Ivan Aivazovsky (1889, National Gallery of Armenia) depicts Noah with his family, and a procession of animals, crossing the Ararat plain, following their descent from Mount Ararat, shown in the background. Hayk, the legendary founding father of the Armenian people, as depicted by Mkrtum Hovnatanian (1779-1846). Ararat is pictured in the background. Lebanese Armenians protesting Turkish Prime Minister Erdoğan's visit to Beirut in November 2010. The poster reads "Ararat is and remains Armenian". 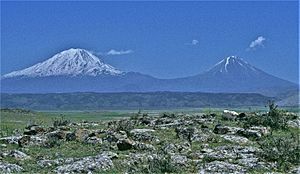 The Russian poet Aleksandr Pushkin wrote about Ararat in his Journey to Arzrum. Mount Ararat Facts for Kids. Kiddle Encyclopedia.